We have reached a point in our lives where everything we do is dependent on technology and a prime example for this is the continued growth of social media. Over time, its power seems irreducible as more and more people are continuing to patronize the medium. That said, a lot of variations have emerged from its popularity, ranging from hobbies to passions, even businesses to professions. 2018 has somehow made a name for itself to be a year of influence, making the act of “influencing” mainstream. With this unforeseen phenomenon of where people simply create contents online and be feted upon by everyone, businesses are eager to collaborate with this so-called “influencers” to reach a much wider audience. Shares, likes, and reviews are this generation’s basis for influence. The higher the number, the higher the tendency to be noticed. And as evident with today’s medium, businesses opt to do sponsorships for these individuals. Where they mutually agree to provide each other with benefits that greatly affect them in the long run. You may also see donation agreement templates. These sponsorships could range from almost anything between the range of needs and wants. Most common businesses that tap into this form of business and promotion are restaurants, cafes, and bakeries. All of which that have something to offer and something to be promoted. Sponsorship in the age of influence is double-edged— it is an effective means for promotion as it is a business. Businesses commonly resort to this option when they want to expand their business to a much bigger audience and explore other means of promotion, which relatively resonates with everyone given how social-media-based everything is nowadays. Also given the success of so many “influencers”, is also the rise of so many aspirants— those who want to be just as successful as those they look up to. With numbers of influencers emerging on a daily basis, it is to no surprise most businesses opt to indulge in what is called now an “influencer marketing”. Wherein businesses choose to do part of their promotions by appointing an influencer to show off their products. 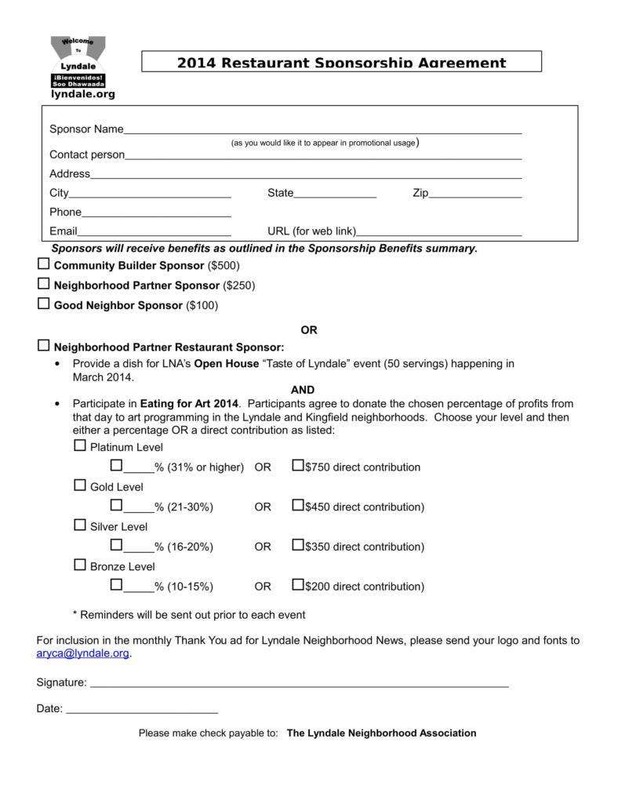 You may also see sponsorship application templates. For this case, show off the restaurant, café, or bakery (their interior, foods, services, and so much more) in an authentic, unformulated manner. This is done by simply reaching out, whether through the traditional, formally written emails or through DMs or direct messages which is by simply messaging an individual directly in whatever social media platform available. 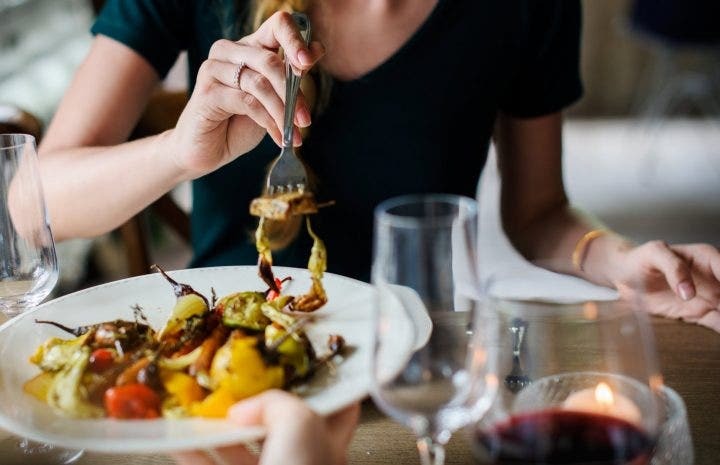 Most are accustomed to the idea of clothing brands sponsoring influencers for promotion, but not as much with restaurants, cafes, and bakeries. Considering the wide range of influencers have a high tendency for food-natured businesses to flourish using the influencer marketing strategy by simply doing sponsorships. You may also see funding agreement templates. Such businesses can simply reach out to an influencer, layout all the details, and go on with the whole process. Commonly for these kinds of businesses, they provide influencers their best sellers for free and simply ask them to promote it on their social media platforms. Others create contents that revolve around the products provided, whether through a video, a photograph, or an article. Most businesses simply layout their intent and what they want out of the sponsorship, and in return, the influencer also demands aims that is most beneficial not only for his or herself but also for the business. You may also see contract agreement templates. Sponsorship agreements only work effectively when the intent is clearly relayed to the sponsored. With both parties on the same page, a fruitful business out of sponsorship will come out. And, in order for a sponsorship to work, a letter stating the agreement must be at the ready to provide the influencer an in-depth idea of what is to take place, and what guidelines to follow. The purpose of having a sponsorship agreement at the ready is to inform the sponsored of the things he or she will be getting out of it, and so as you. In the agreement, blatantly state what the intent is by stating the purpose of the sponsorship that is sometimes in the guise of a collaboration. You may also see sample agreement templates. Simply enumerate all the necessary details that entail the sponsorship. From what period it begins and ends, to the guidelines an influencer can and cannot do. This will simply provide a much more extensive information of what the sponsorship entails and ultimately, will help the sponsored influencer whether to pursue the sponsorship with the agreement present. You may also see participation agreement templates. 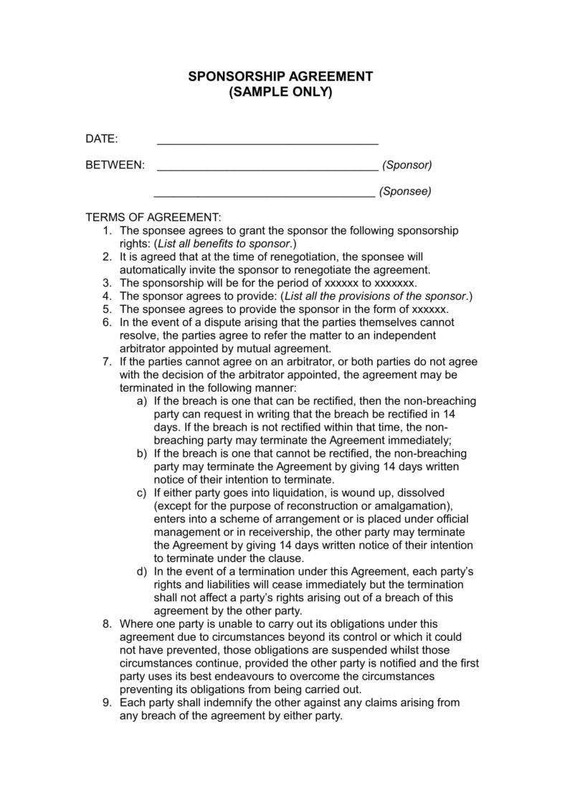 To put context into the whole consensus of the sponsorship agreement, simply include the terms that entail the agreement. This can range from clearly imposing what the relationship is between the sponsor and the sponsored, to the allow use of any intellectual property that belongs to the business. 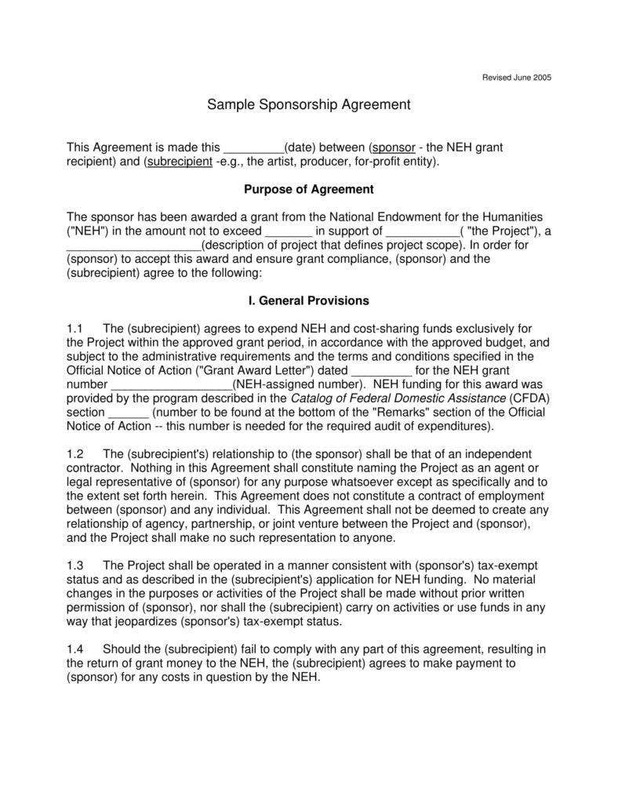 This, in a way, is similar to the enumeration of what the sponsorship encapsulates, just that, the terms are the grounds of the agreement. You may also see sponsorship proposal templates. It is extremely important for a sponsorship agreement to be detailed and elaborate, to provide an effective means of a business transaction between the sponsor and the sponsored. This way, nothing will be overlooked or to an extent of negligence resulting for miscommunication and at the most, misunderstanding. You may also see agreement templates in word. In order for a sponsorship agreement to work, certain measures should be taken. It is important to put in mind the gravity of a well-written document for legal transactions. Just because you are dealing with sons and daughters of the millennial generation does not make it valid to approach them in a casual manner, congested with jargons that mostly only them can relate to. A business document is still for simple business, which is formal by nature, which is necessary when dealing with any people of any profession. As stated earlier, it is important for a sponsorship agreement to be written formally to still be able to elicit the formality of the whole process. This way, you are also, in a way, relaying the message of professionalism and credibility to whoever you are trying to sponsor, thus eliminating whatever doubt they have towards your business. You may also see sample franchise agreement templates. A sponsorship agreement contains all the necessary information that encapsulates the whole idea of the sponsorship. It is a necessity to write all the details, without leaving anything behind to put miscommunication and misunderstanding at a minimal. Everything should be stated in the sponsorship agreement, from the period with which the sponsorship will last to what the influencer is allowed to do or not. You may also see agreement letter templates. In line with writing all the details necessary for the sponsorship, elaborating these details is also mandatory. This is most useful with guidelines needed to be strictly followed and the repercussions when failed to do so. Elaborating the context of the details in the sponsorship agreement simply helps the sponsored fully understand the entire process of the sponsorship. You may also see construction agreement templates. As times are evolving, methods are going along with it. With businesses now seeing marketing influencer as a more effective means of promotion, there is their tendency to indulge in such method by opting to do sponsorships that are in the guise of a collaboration. It is prevalent, rampant, and common among businesses, thus the importance of sponsorship agreements to avoid miscommunication. You may also see club sponsorship proposal templates. If you find this article helpful in any way, do not forget to bookmark this page for future references. And, kindly share this with other business owners seeking for sponsorship agreement templates to use in their future endeavors.